As an artist, I’m always looking for recycled material to be used in my work. 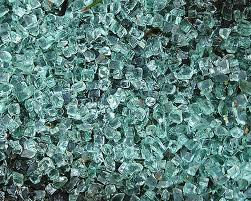 Material such as tempered glass sheets, mirror sheets, and plate glass sheets. I find it absolutely amazing that most of the custom glass companies in my town don’t recycle their own glass. All of these places do custom orders where a sheet of glass is cut to a certain measurement and what ever is left over is tossed into the trash and broken into a hundred pieces. One day I went to my nearest glass company and introduced myself and told them that I was a sculpture artist who primarily used glass in my work. After viewing my website and a portfolio, they were happy to contribute. I talked to two other glass companies and they too were willing to save some glass for me. It was amazing how much clear glass and mirror ( big pieces), I was able to acquire in just 1 month. It kept me busy for weeks with many projects underway. If I had to buy the same amount of glass I aquired for free (recycled), I’d would’ve spent well over $200. It’s so nice to know that I can re-use this material.